In our article on Bullet Coating we covered the basic principles of applying dry lubricants to “naked” bullets. This article covered the three main coating options: Molybdenum Disulfide (Moly), Tungsten Disulfide (WS2 or “Danzac”), and Hexagonal Boron Nitride (HBN or “White Graphite”). All three compounds can be impact-plated on to bullets with relative ease, using inexpensive equipment. Moly is still the most popular choice, but many more shooters are considering HBN because it is ultra-slippery, it is less messy, and it offers some advantages over Moly or WS2. 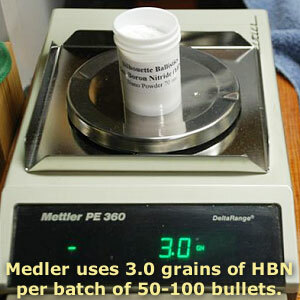 After we published our Bullet Coating feature, many readers asked for more info on HBN. Some current moly users had questions about switching over to Boron Nitride. Forum member Larry Medler has published an excellent web article discussing the process of applying 70nm HBN using plastic jars and a Thumler’s rotary tumbler. If you are working with HBN currently, or plan to experiment with Boron Nitride, you should read Medler’s HBN-Coating Article. Share the post "Boron Nitride Application Procedures for Bullet-Coating"
What I’ve missed so far w/regard to HBN discussions, is a basis. I know the advantages of WS2 over moly, and I wonder why I should go from WS2 to HBN. I already know WS2 is a success for pre-fouling. I dry burnish the bore after cleaning. So how well do barrels pre-foul with HBN? My experiences with hBN indicate far less pre-fouling needed with clean bores than moly. Never used WS2 so can’t offer up how that behaves by comparison. Biggest advantages to me of hBN over the alternatives are 1.) no sulfur involved and 2.) far less trouble to obtain a decent bullet coating. Sulfur and moisture in combination are enemies of barrel steel, whether chrome moly or stainless. Corrosion is the inevitable result if steps aren’t taken to prevent humidity from reacting with the sulfur compounds left behind when moly is used. David Tubb pioneered using hBN for bullet coating largely because of his experiences with moly giving inconsistent performance across changes in ambient humidity when shooting.He’s certainly “good enough” to notice the difference where others may not. I’ve found it’s much easier – once the details are worked out – to consistently produce home-coated hBN bullets than with moly. Steve, have you pre-fouled a clean bore with HBN? Was the first shot with the rest? Have you considered use of WS2? If anyone is interested, my company manufactures HBN and has sampled quite a bit for use in barrel treatments, bullet tumbling, and incorporating in the charge. We sell through a hobbyist by the name of TAI Lubricants. You can contact them at: Tom Madden, nyoil@aol.com, 302-326-0200. Mike – no, I haven’t tried that yet; typically I shoot a clean bore either offhand (for NMC events) or let my sighters foul the bore before record shots for long range. When I used moly I’d pre-foul clean bores with something like moly-slide paste. I use bullet lube to reduce friction and swaging forces bullet jackets undergo when encountering the bore lands, nothing more. I have some Danzac but never tried it for the same reasons I don’t care for moly: messy stuff to work with and the sulfur component worries me with regard to its corrosion potential. I know others who use and like it but the same can be said of moly. Jon – can you share anything from the results of your sampling program? To non-technical end-users, that kind of information could shed some light on what is otherwise a rather dim area of expertise. I feel bullet lubes have their place in our sport but backing up that conjecture with facts isn’t as easy as feeling confident based exclusively on personal results. To be honest, the whole application has only recently “bubbled up” to be noticable in our list of application inquiries. More and more are trying the material. I think we’re waiting on those folks to confirm the benefits. I can also tell you that this application is gaining more attention internally, and we are evaluating how we should respond. That’s all I can say. Thanks Jon, the two latter links are news to me. Thanks for posting them! Yes, this application is new-ish for shooting sports; Tubb switched three or four years ago & the rest is history. He’s the only commercially available source (Superior Shooting Systems) for custom-coated bullets ($50/K) that I’m aware of, besides the 6mm DTAC 115 he developed and sells. Those of us who have undertaken to get involved are do-it-yourselfers; I bought a pound of .5 micron powder from Impex Canada in 2006 & have been coating my own bullets ever since to good effect. What about all of the countless world records that have been set without all of this questionable coating crapola? That is what I would like to know…. It seems Larry’s story is dated 2008. Is there any follow-up info: Chrony faster, slower? More consistent? Reduced barrel fouling? More accurate? Reduced vertical? Seems there should be some data accumulated in the last four years. I’ve purchased from Tom (good guy). I coat both my projectiles (HCPL grade – tumbled in small jars) and barrels (AC6111 grade – mixed in 90% isopropyl alcohol and swabbed in). No comparative data as the only serious shooting has been done using hBN. They also carry Ws2/Danzac and moly. I have not tried their products.